Survivor just released the names of the new cast who will appear in the show's 25th (can you believe it!!) season in the Philippines. Among them, 1980s sitcom star Lisa Whelchel and major league baseball MVP Jeff Kent will join 13 other new players — as well as three returning ones — when Survivor: Philippines premieres on CBS with a special 90-minute episode at 8 p.m. ET on Sept. 19.
Who knew that Lisa Whelchel (aka Blair Warner from The Facts of Life) was living among us all this time? As a child of the 80's I watched Facts of Life and like millions of other gawky teenage girls, totally wished I could be the spoiled and sassy Blair Underwood and attend Eastland boarding school. 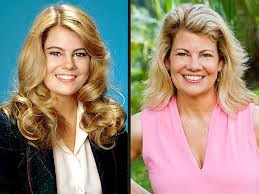 "With the announcement of the new cast of TV’s reality-game show Survivor, we learn that Lisa Whelchel, who played the prissy Blair on ’80s sitcom The Facts of Life, will be among those trying to manipulate their way to the $1 million prize in the Phillipines-set season beginning Sept. 19. Whelchel is listed by CBS as living in Dallas, though my sister-in-law’s family used to live down the street from hers in the Lantana community up in Denton County, and the actress/author/speaker’s website lists her mailing address as a P.O. box in Flower Mound. In the video above, you’ll get a chance to hear how the 49-year-old is a big fan of Survivor, who campaigned to make the cast, doesn’t plan to lie or cheat her way to the title. I haven’t watched this show since its first season back in 2000, but that doesn’t seem like the soundest strategy. Unless her strategy is to pretend like she’s going to employ a dumb strategy, and then maybe it’s brilliant."